For some reason Newsblur (my RSS reader of choice) decided to change their username method, eliminating a special character I had in mine, and effective wiping my account. This is pretty frustrating as I went to open up the glorious pile of blogs to find absolutely nothing. 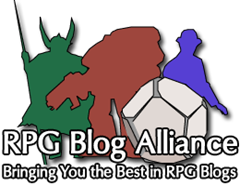 I’ve been adding blogs to this for quite a while, digging deeper and deeper into the D&D blogosphere, but now they’re gone, and the only list I had left was the blogroll here on the site to initially rebuild from. That was the start of my morning at least, hey, it’s Saturday, I can do whatever right now. Needless to say after not touching the blogroll on the site for several months, there’s been quite a few that have moved on, changed topics to something less interesting, or just disappeared entirely. My need/desire for an online presence waxes and wanes less often than the moon changes, and Return of Reckoning has been keeping me busy in the areas that I’ve been able to assist the developers, I would say most of my reading is done in those forums. However, having old, dead, or unrelated blogs hanging about on a roll that is questionable whether or not anyone bothers to click on strangely bothers me, so I’ve cleaned it up. It just keeps getting shorter. Is there something amazing about Blogspot that I don’t understand? Literally all but three of the D&D sites are based there. I really don’t intend to move this monstrosity onto another platform any time ever, but it’s a staggering difference, something like 90% of D&D blogs are Blogspot. Rather curious. Anyway, since my last post I’ve traveled to LA for 10 days of work (12h per day), had a major power outage over 48 hours at our main datacenter and call center simultaneously, and rolled out 60 new workstations across two different buildings. My nights have consisted mostly of coming home, firing up the hookah, checking the RoR forums, and trying to keep out of my work email so I can relax a little bit before the next day of chaos. Would I like to work on my D&D stuff? Hell yes, but the campaign isn’t even running right now, and pending some projects that I’m in the middle of (but not working on), chaos has far too large a brain tax. Perhaps I’m just undisciplined and out of practice, a combination of both perhaps. This streak of apathy is nothing new, but I don’t think it’s totally predicated on depression like that last time. I don’t feel bad or anything, just… busy. Busy trying to stay distracted. I should really get back to work, creating things. I preach it to my wife all the time. Just make something with your life, use your talents, leave an impact somewhere, anywhere, it doesn’t matter if you get a hundred likes or it turns into a piece of archaeology not to be seen for a thousand years. Life is too short, the regret you feel is from absorbing everyone elses creativity while giving back none of your own. Anyone can be creative, they just need to find the right outlet for them. I’m pretty sure D&D, or writing, is my outlet, I’ve actually felt that for a very long time and the body of work here is strong evidence. Whether or not I follow up on it, that’s a different problem to root out. edit: Somehow my profile was still working on my phone and I was able to change the account name and login normally. Lucky too, as this is my premium version of the account, where using the same email and logging in gave me the basic account. Quite a bit of a relief. Still went back and trimmed out several things however, less is more when it’s of relevant quality.